Not food, but a cool, long-tail cargo bike that's great for hauling stuff. My daughter Frankie bringing home our Christmas tree. I now have put almost 2,000 miles on the Yuba Spicy Curry e-assist long-tail cargo bike I bought from Fyxation back in August. At more than $5,500 with tax and all the accessories, it is the most expensive bike I’ve ever purchased, but in four months or so of riding it, I haven’t regretted the purchase for a minute. I live in a family of three drivers and we all share one car. My wife and daughter use the car most often because they ride horses three to four days a week at a place 30 miles south of our home in Milwaukee, so the car is often gone when I need to haul something. We have managed this way for years with me relying on our Workcycles Omafiets, which is a workhorse, and our old Burley trailer, repurposed for cargo once our daughter outgrew it. I have been intrigued by cargo bikes and “bakfiets” since I visited Amsterdam and Copenhagen ten years ago, and I have always wanted one. Because I like the Dutch and Danish style, I have always preferred the traditional bakfiets (translation: box bike) in which cargo is in the front. The reason I bought a long-tail style cargo bike is that as a photographer, long-tails allow me to sit on the back and photograph a person or group of people riding behind me for the stories I do. The reason I got an e-assist long tail is because it makes it easier to find volunteers to pedal me around for photoshoots. I had run out of friends willing to pedal me around for an hour and trying to stay in front of group rides. With the electric assist on the Yuba Spicy Curry, people love to volunteer as my stoker. A photo I took sitting on the back of the Yuba while Tristan Klein pedaled. Unlike a throttle controlled hub-drive electric assist bicycle, the Currie Technologies mid-drive assist on the Yuba only works when the rider is pedaling. There are four levels of assist and I most often use two or three depending on how much of a hurry I am in on a cargo run or how fast the rider I am photographing is going on a shoot. While that was the primary reason I spent the extra money to get an e-assist bike, I have since found it has other advantages. Foremost is that I no longer worry about adding extra trips to pick something up or consider hills when I have to haul something. 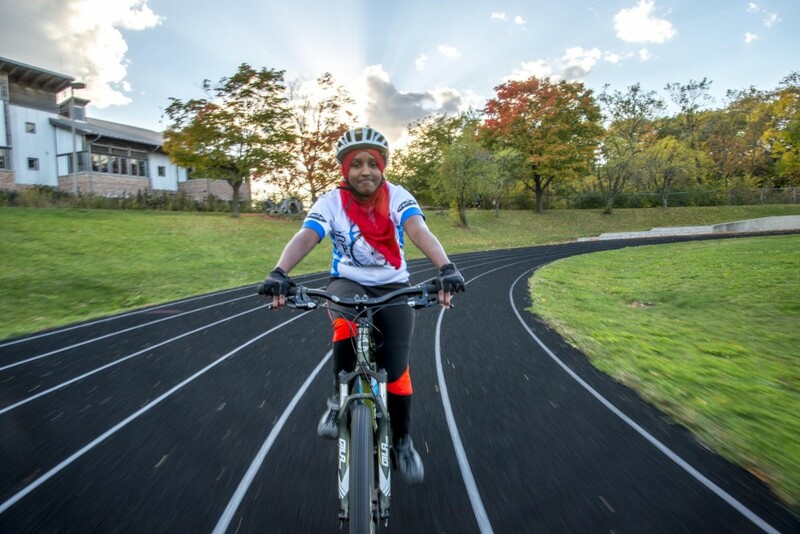 With the assist, hills don’t matter. Without the assist, I might not add an extra trip to fill a growler after I go grocery shopping because it adds three pretty big hills to my round trip in order to get to the liquor store that typically has a sour on tap. With the Spicy Curry, I never have to worry about buying more at the grocery store or farmers market than I have room for on my bike. The other advantage that the e-assist has over a regular bike is that I always get where I am going faster. I still have to pedal, and if I am in a big hurry, I still have to pedal hard and might be sweaty when I arrive, but I always arrive faster. In assist level 3, I can pedal 20mph+ on the flats if I push it, even with a heavy load. I can pedal 20mph up hill if I really crush it. The extra speed means I don’t mind adding extra trips. One caveat is that the battery life drops off quickly at assist level 3 or 4. I often travel 25-30 miles in a day between going to the office, to meetings and running errands. If I try to do that on assist level 2 or 3 all day, I might run out of battery power. When that happens it isn’t a big deal as I can still pedal the bike normally, but I don’t understand why Yuba and other e-assist cargo bike companies don’t offer a 15 or 20 amp hour battery with cargo bikes. All the couriers who have added e-assist to their cargo bikes run custom made 20 amp hour batteries. The accessories I have are the “Bread Basket with liner” front rack, the rear “Carry-On” rack, the “2-Go Cargo Bag,” the “Stand Alone” double kick stand, and the “Soft Spot” rear seat pad. A minor quibble I have with the Spicy Curry is the front headlight it came with shut off every time I hit a pothole or bump in the road so I had to add an aftermarket light. I added the Schmidt Edulux II headlight, which now works perfectly and is much brighter, but that is an easy fix for Yuba with a different OEM light. Second problem: while I love how the front “Bread Basket” rack allows me to haul heavy loads without affecting steering because it mounts to the frame instead of the front fork, the seams of the liner bag it came with tore after a month of use. Adding two more cross bars on the bottom at the corners would solve that problem. The biggest actual design flaw with the bike is that after a while, the rear wheel began slip in the semi-vertical dropouts. I could not tighten the quick release enough to keep the wheel from slipping under a load, so I had to make a custom metal bracket to hold the drive side in place. This could be fixed with a bolt-on axle or a rear-facing track dropout with set screws. 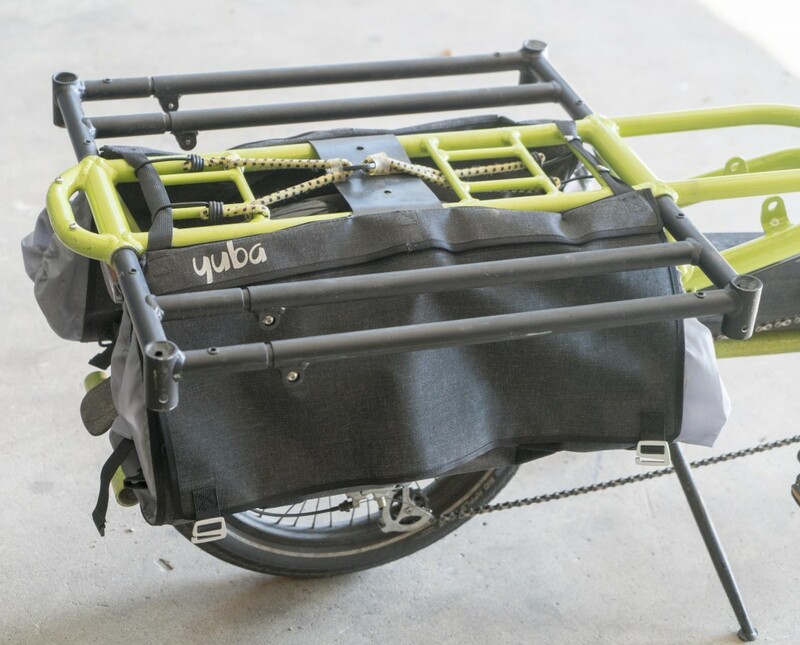 The only other design flaw is with the very cool Yuba Carry-on rear rack system. 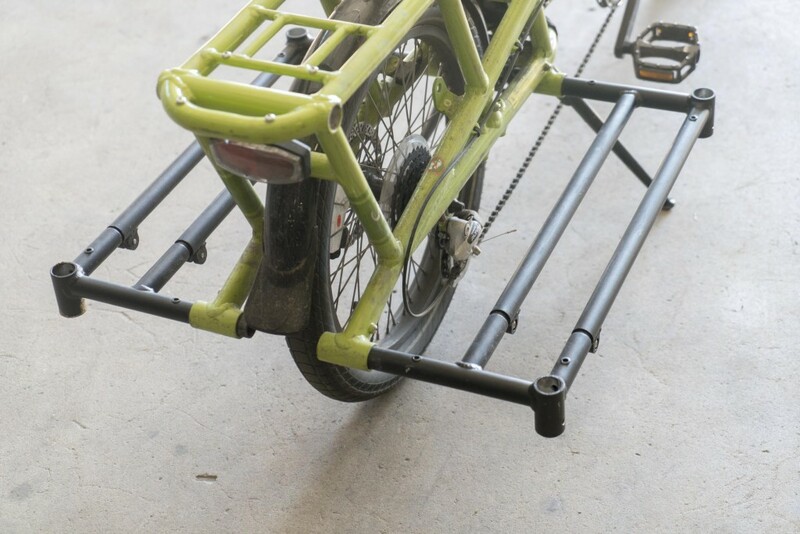 It is an incredibly versatile rear rack that allows me to haul large loads when I have it in the upper “flatbed” position and in the bottom position it works well as a foot rest and to keep heavy loads low, like when I have both 45lb dogs in the plastic tubs. The problem is that it is very difficult to install and remove, even though it has a snap-tube release system similar to a vacuum cleaner tube. The clearances are just too tight, so it gets jammed if I don’t pull it out perfectly square. I typically need a small hammer to install or remove the racks. Finally, Fyxation has not been able to order me a second battery either from Yuba or Currie Technologies. It seems the dealer service from both Yuba Bicycles and Currie Technologies is really bad. The owners of Fyxation have called and emailed many times and they just don’t get a response. I have heard the company is sold out of the bikes and many accessories and might even be moving production to a different factory, so maybe that accounts for the slow service they give their dealers. Carry-On racks in the lower position work well for foot rests. The Carry-On racks are incredibly useful in the upper position to work as a faltbed. Note the Two Go bags fit on the bike no matter where you have the rear rack positioned. But all-in-all I love the bike. This is the first generation of a new bike, so there were bound to be a few issues. I hope Yuba fixes the few minor design problems with the bike and improves their dealer service, but like I said in the beginning of this blog post, I haven’t regretted the purchase for a minute. So, after 2,000 miles, would I still get a Yuba Spicy Curry instead of a similar Xtracycle Bosch Edgerunner 10e? I have never been able to try riding a Bosch Edgerunner because no dealers stock them in my area, so I have no idea how they ride or if I would have similar quibbles. 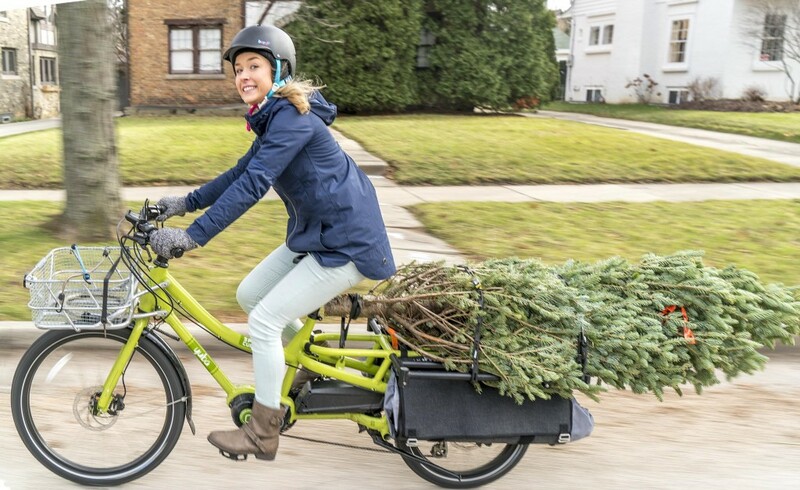 I tried to get one from Xtracycle to test, but their production was really delayed (even more so than Yuba) and they never offered to help me, so maybe the slow customer service just comes with these new cargo bikes. 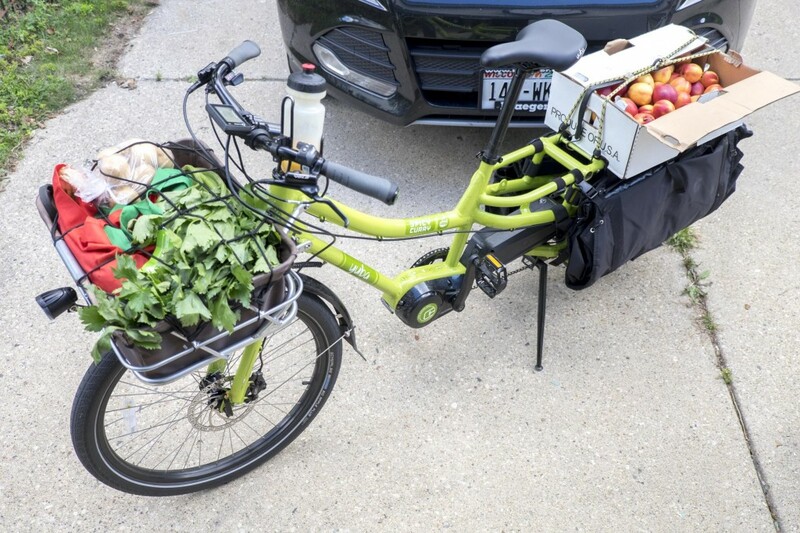 The Edgerunner is also another $700 more and they don’t offer the really cool flatbed-style rear rack, which despite the difficulties mounting and removing, is incredibly versatile for hauling everything from passengers (canine and human) to four full crates of fresh peaches. I totally love that rear rack and can’t imagine living without it. That would be a loss if I were to ever ride an Edgerunner. The bottom line: after hauling everything from my wife and daughter to my dogs, fresh peaches, bicycles, and even our Christmas tree, I still love the Yuba Spicy Curry. Get your daughter in yellow jacket, with strobe, do not want to lose more riders.